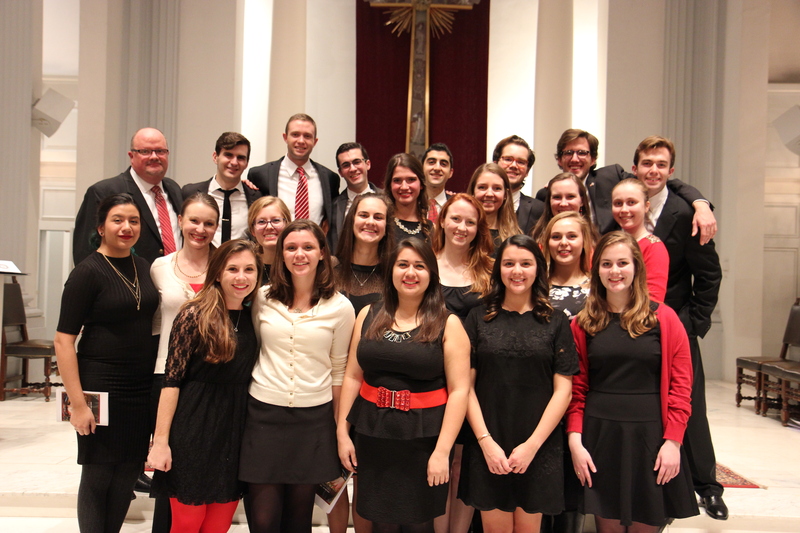 Eva Lucchino (2nd row, 4th from left) performs with other choir members at our annual Lessons and Carols event. Eva Lucchino is a junior in the college majoring in English and minoring in History and Theology. What does it mean to you to be a cantor? Ever since I was a little kid I have loved singing at Mass. I remember looking up at the cantor or the members of the choir and wondering when I could do that too. As a child, I mostly enjoyed Mass because of the music, but as I (and my faith) matured, I realized the importance of music in elevating the celebration of the Eucharist. Singing at Mass became less about being like an adult and more about recognizing God’s presence in my life. As a cantor, my hope is that I can help people enter into a state of prayer through the music. When I sing hymns like “Amazing Grace” or “O, Come, O, Come, Emmanuel,” I am amazed by the beauty of God’s grace. There is so much love, so much faith contained in those songs, not only in the beauty of the words, but in the way music captures me. I hope that as a cantor I can help others to let their worldly concerns go for an hour and enter into the Mass recognizing God’s abundant love and mercy for them. This entry was posted in Programs, Reflections and tagged Arts, Catholic, Student Organizations. Bookmark the permalink.